The battle is all but over, and hope seems to be lost. Zoe and her fellow Resistance fighters are on the run, having lost their home, their protection, and their leader. They are outnumbered and outmatched by the powerful corporation that controls the world, and the cruel Chancellor is inches away from completing a scheme that would kill most of humanity. Zoe's only remaining option is to chase the impossible dream of upending the Link system, freeing the world from the hardware that controls their thoughts and emotions, and hope it will trigger a revolution. The plot requires a nearly impossible mission to infiltrate the dangerous Community, and it is a task that Zoe must unfortunately complete alone. With challenges and surprises at every turn, nothing goes according to plan. Adrien's visions of the future now show two possible outcomes: one in which they succeed, and one in which humanity falls. It all lies in Zoe's hands. What an amazing ending to an awesome series! If you've read the series so far, then you know that things seem to have taken a turn for the worst. Zoe has been through so much since first being rescued from the Community and its amazing that she is able to step up and take the leadership role she was born to fill. Adrien is a completely different person after the cruelty he endured, and its hard for Zoe to connect with him like she used to. Then there is the evil Chancellor who always seems to be a step ahead of the Resistance and is getting close to completely destroying them altogether. Despite all of this you can see the growth Zoe has experienced and her determination to make things right and free humanity from the Link. This novel has a lot of action and adventure which keeps the story moving at an exciting pace. Everything culminates into a jaw-dropping ending with an unexpected twist in one of the characters. 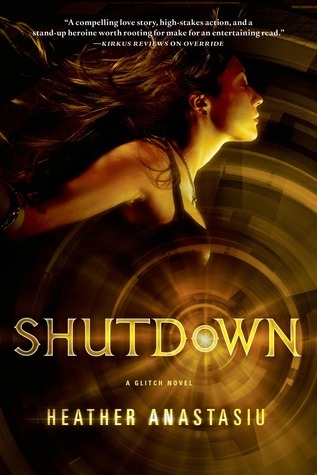 I definitely recommend you read this novel if you like books about kids with awesome powers or dystopian novels, but definitely pick up Glitch and Override before you tackle this one.